A row of three small terraced cottages. Each one has a distinct character and there are small outbuildings in the back gardens - a greenhouse and a garden shed. 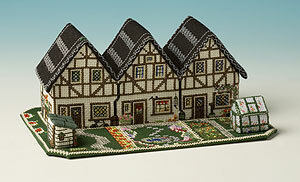 The cottages are 7 cms high and the base approximately 17.5 cms wide. A great project for the more experienced stitcher.